Once again, you’ll be able to download the Visual Studio solution matching the end of the second tutorial at the end of this article. We will still have of course the video live preview stretched and centered. But I’d like to have at the bottom of the screen an overlaid transparent bar with some textual indications (“Tap screen to capture media” for instance). I’d like also a vertical bar on the right with a nice styled radio button in the center allowing me to switch between the photo and the video mode. As you can see, we have the 3 parts of the targeted layout. The control bar will have to be placed vertically on the right. The overlaid div will be displayed horizontally at the bottom of the screen. And last but not least, we have to support all possible resolutions using some fluid containers and best practices. We need also to style the default radio buttons using the red color when checked and more importantly using some vector symbols in their content to visually indicate their function. In Windows 8 applications using our Modern UI style, we’ve got a lot of available symbols in the Segoe UI Symbols font family for that. 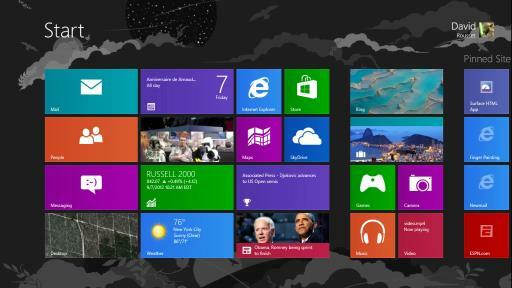 If you want to know more about that and find how to select the proper symbol in your code, you can read this article from Jonathan Antoine: Windows 8 Metro apps – a lot of icons are available out of the box ! In my case, I’m going to use the photo glyph which got the “E114” code and the video one with the “E116” code. Those 2 characters with be centered into a circle generated thanks to CSS3 border radius using a radius of 50%. Press F5 to check you now have the same layout exposed in the first screenshot. If you want to better understand the CSS you’ve just simply copy/paste into your Visual Studio solution, you should learn to how to use Blend 5. It’s really a powerful tool to work on the CSS part of your Windows 8 applications. Feel free to change some Flexbox values or Grid values to break the layout and learn those features. Now, we need some simple logic to check the current radio button state to decide if we need to call the code that will create a photo or a video. document.getElementById("capture-status").innerText = "Recording. Tap screen to stop." Again, the code is very similar to capturing a photo. Choose the type of video profile you’d like to use via Windows.Media.MediaProperties.MediaEncodingProfile (MP4 or WMV) and choose also the quality targeted with Windows.Media.MediaProperties.VideoEncodingQuality (Auto, 1080p, 720p, etc.). Press F5 to test that your application works. Once launched, switch to the video mode by clicking/touching the radio button, tap or click the video to start recording and tap or click again the video to stop the recording. Well, our app starts to be fun but it’s missing an important part: some visual feedbacks. Indeed, when you’re taking a photo for instance, it’s far from being obvious that something really happened when you’ve tapped or click the screen. I’ve taken 2 photos and each time you’ve seen the slide effect in action. Let’s now see how to code that. We need a HTML container first. This container should have an image tag. The source of the image tag will be dynamically provided during the snapshots done while using the application. We could then use a WinJS control supporting the binding mechanism for that. We’re using the WinJS Binding Template control as we will be able to use its embedded binding feature. The source property of the HTML image control is indeed dynamically affected via the binding expression: “src: url”. We will then have to provide a binding object containing an url property. The animation is very simple. Only 2 keyframes are defined. It’s enough to achieve the slide effect which is just a complete translation from right to left, or from 0% on X to –100%. This animation is launched by the slide class affectation. It’s slightly delayed during 250ms to let the user tapping/clicking without stress and it lasts 1s. It’s quite easy as we already have a picture we just generated with the capturePhotoToStorageFileAsync function. We just then need to build a temporary URL in memory that will be used by the previewSlide function for our WinJS template. That’s why, the oneTimeOnly boolean is set to true. We won’t reuse this URL allocation later. So, let say to the system it can garbage collect this memory as soon as possible. To provide an image URL to the previewSlide function, we’re using the WinRT getThumbnailAsync function. Press F5 to check that everything is working as expected. Anyway, great series of posts! Thanks for your feedback Rick!